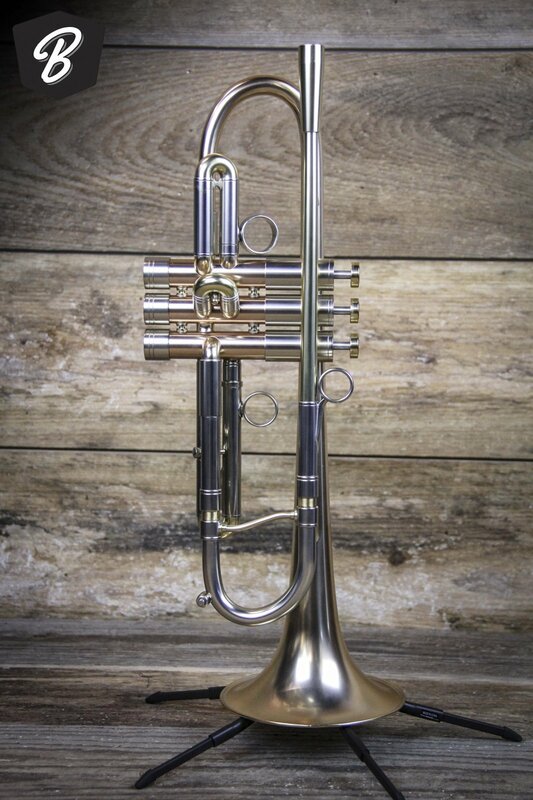 The A4 is one of our most popular models in the trumpet line. This horn is a result of extensive collaborative work with Adams Performing Artist Amik Guerra. This is one of our heavier models. Featuring a 5.5-inch one-piece bell and also a heavy chassis this horn is an ideal choice for the soloist looking for an extremely rich, warm, fluid, and thick sounding horn. One of the things we stress about this instrument is the fact it will work in many different musical environments due to wonderful coloring and richness on this horn. While most people order this horn in the larger .470 (12mm) bore we do make a .460 (11.7mm) bore instrument on request for clients. Also available in this model is a shepherd´s crook model which allows for more personal expression in the dynamic and articulation palette. Includes Adams Gig bag case and accessories. Thanks for shopping with BME!